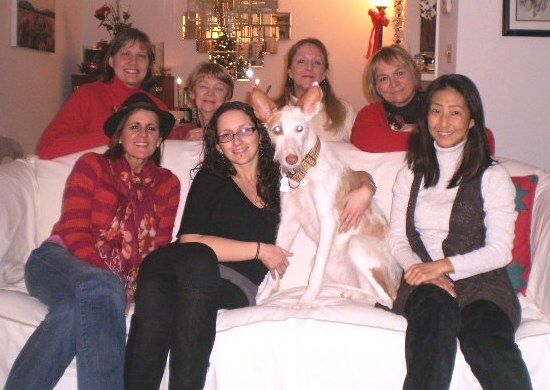 Susan Waltman discovered positive dog training methods more than 20 years ago. Since then, using only these positive methods, she has earned more than 100 titles with her dogs, including a Utility Dog title on each dog she has owned. Her dogs have earned recognition in obedience, agility, regional & national tournaments, plus other dog sports including herding, lure coursing, and dog scootering. She is currently owned by Clue, her new Saluki who is following in the steps of her beloved Puzzle, her first Saluki, who had competed at the top levels in obedience and agility. Puzzle also performed service dog (balance/mobility) work for Susan, and she is training Clue for similar work. Susan believes that training should be fun for both dog and human, and her instruction for the past 19 years has aimed to enhance that relationship. She was one of the first in the DC Metro area to train using only positive motivational techniques and has continued throughout her training career to pioneer a training method that is both humane and fun for dogs and humans alike. She is endorsed by NADOI (National Association of Dog Obedience Instructors). Joan MacKenzie, CPDT, discovered her passion for dogs after she retired from a career as an international lawyer for the federal government when she adopted her dog Sandy, a Tibetan Spaniel, who had been thrown out on the road from a car in rural Georgia. Sandy has such a love of learning that Joan had to become a trainer to keep up with her! Sandy is a natural athlete, so Joan has learned agility; rally obedience, flyball and tracking, to name some of the team’s favorite sports. This rural outdoor dog was not socialized for suburbia, so Joan became experienced in classical conditioning as well, working with Sandy to overcome her fears in her new environment. Joan, a member of the Association of Professional Dog Trainers (APDT), is also nationally certified with her CPDT certification (Certified Professional Dog Trainer) . In addition, Joan is pursuing certification in Tellington Touch, a gentle, therapeutic training style that has been very effective helping Sandy overcome her fears. This is an intensive two-year training program that will complement Joan’s experience with obedience and sports training. Joan is using all of her experience to help the neediest dogs at a local animal shelter several days a week. Laura Heyer has always loved dogs, and always thought she would work with animals while growing up. She worked at a veterinary clinic throughout high school, college and part of graduate school while working on her Master's degree in the field of education. For over 20 years, Laura has worked in the special education field as a teacher and administrator with students with behavior and learning issues, but she has never forgotten her desire to work with animals. She has combined her love of teaching with her love of dogs and now teaches classes for C&C PALS utilizing the same tenets of learning theory she uses at school. She worked through the various levels of obedience classes and K9 Nose Work® classes offered by C&C PALS with her own dog, with the result that Saffie has earned her CGC and her NW1 titles. Students and staff at Laura’s school enjoy it when Saffie comes to school, where one of her roles is an official greeter on bus duty. Laura is a member of the Association of Professional Dog Trainers (APDT), and is working towards becoming a CPDT (Certified Professional Dog Trainer). In addition, she has begun to study Tellington TTouch methods and hopes to become a TTouch practitioner in the future. Yuko Furumoto, CNWI, found her passion for dog training when she got her first dog, a toy poodle named Manon. Yuko wanted to understand her dog’s mind and raise a dog that she can take anywhere. She trained Manon to compete in agility where they earned 5th place among 60 dogs in the intermediate level in a big competition in Tokyo, Japan. Yuko and Manon have also competed in obedience and Manon has appeared on TV commercials and in magazines. With this success, and finding herself helping her friends train their dogs, she decided to pursue a career in dog training. Yuko’s inquisitive nature comes from her background as a journalist and researcher. She earned her Master's in International Relations in the United States before working as an economic researcher and financial reporter in the U.S. and Japan for many years. After finishing a formal intensive dog training program in Japan, where she acquired extensive hands-on experience with a variety of breeds, she worked as a freelance trainer, visiting homes to help owners better communicate with their dogs. After returning to the US in 2009 with her husband and two dogs, she has been focusing on nose work, training her two toy poodles in tracking and K9 Nose Work® . She has always been fascinated by the scenting ability of dogs and is excited to have an opportunity to teach K9 Nose Work classes at C&C PALS. Yuko recently also completed a graduate certificate course in Applied Behavior Analysis and is a supporting member of International Association of Animal Behavior Consultants (IAABC), pBATI (pending Behavior Adjustment Training Instructor). Sharon Kirby, CPDT-KA, a certified AKC Canine Good Citizen (CGC) evaluator, and member of the Association of Professional Dog Trainers, believes wholeheartedly that people and dogs have a unique bond that blends fun, affection, communication, and teamwork. Coming from a background working in both the federal government and private sector, Sharon always found time to work with her dogs in various sports including agility, canine freestyle, and rally. Sharon helps with the nose work enrichment program at the Montgomery County Humane Society and regularly volunteers for two local rescue groups: Lucky Dog Animal Rescue in Washington, DC (LCAR) and the Partnership for Animal Welfare in Maryland (PAW). In fact, being a volunteer assistant in a special "growly dog" class for reactive PAW rescues triggered her decision to become a professional dog trainer. Sharon lives with a Miniature Poodle named Rusty, who she adopted in 2010. Sharon and Rusty are members of the National Association of Canine Scent Work (NACSW). Rusty has earned two titles in the sport of K9 Nose Work® from the NACSW. Sharon and Rusty are also members of the Canine Freestyle Federation (CFF) as well as the Virginia Foxtrotters, a group dedicated to encouraging pet owners to dance with their dogs. Sharon is an Association of Pet Loss and Bereavement (APLB) Certified Counselor and regularly co-hosts in the APLB chat-room which provides support and guidance to those mourning the loss of a dear pet. Paula Dietz joined C&C PALS in 2011 after nearly 30 years as a government relations and communications professional. After losing her beloved 17-year old dog, Annie, and 21-year old cat, Cass, earlier in the year, she decided to follow her heart, embarking on a new career that dovetails with her life-long love of animals. In 1993, when Annie was rescued and Paula adopted her, there wasn’t a well-developed, accepted school of thought about positive dog training. She trained Annie on her own, using love, respect, intuition, and knowledge gleaned from, then, little-known books that emphasized positive-based training techniques. Today, Paula works at a veterinary clinic, is a licensed wildlife rehabilitator, and, through C&C PALS, helps train dog owners to bring out the best in their dogs. Jenny Brawley, CPDT has been a Certified Professional Dog Trainer since 2006. Her passion for dog learning began when she adopted a “hardship” dog from a local trainer. “Kenny” had fear aggression issues, and his adoption came with a follow-up consultation with his former trainer. Jenny took advantage of the opportunity, but the consultation ended with Jenny in tears as the trainer tried to impress the need to administer leash jerks to establish “control” over Kenny. Jenny was convinced there had to be a better way to work through Kenny’s issues instead of using positive punishment. Jenny also figured out quickly that without an understanding of what “triggered” Kenny to be fearful, it was not possible to apply antidotal methods. Thankfully, Jenny found out about positive reinforcement training based on the theory of animal learning. Jenny immediately applied and was accepted at the San Francisco SPCA Academy for Dog Trainers from which she graduated in 2002. Not only did the methods learned at the Academy prove successful with Kenny, but Jenny vowed to apply this new knowledge to help other adult shelter dogs, many of whom are surrendered because they had never received adequate socialization, basic obedience or manners training. Now, Jenny devotes her evenings to her passion of dog training here at C&C PALS. On a volunteer basis, Jenny has been involved with a local shelter since 2001, helping with post-adoption behavioral questions. By day, Jenny is a mortgage fraud investigator. Jenny is also a graduate of the U.S. Secret Service “Train the Trainer” program and this skill has transferred to her ability to teach dog owners how to train their dogs and instill good manners. Jenny resides with her husband and five “kids” (three adult shelter dogs and two shelter cats) in Vienna. She is a member of the APDT (Association of Professional Dog Trainers) and is a nationally certified dog trainer with her CPDT (Certified Professional Dog Trainer) certification.